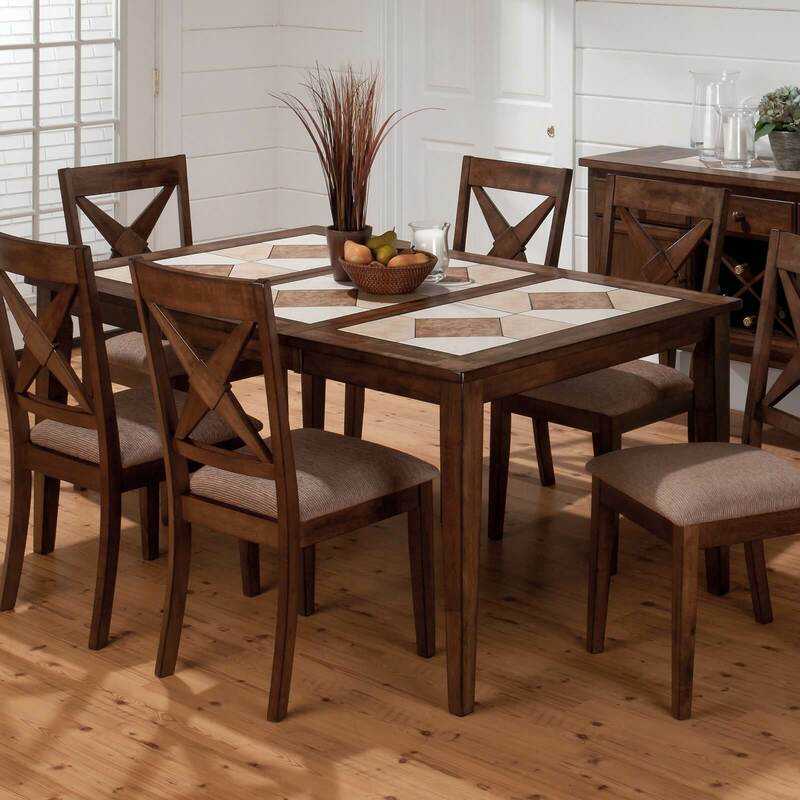 Purchasing a new dining table is an extremely personal experience for many reasons. This furniture will be the centerpiece of a dining room where you entertain guests and share important meals with family. 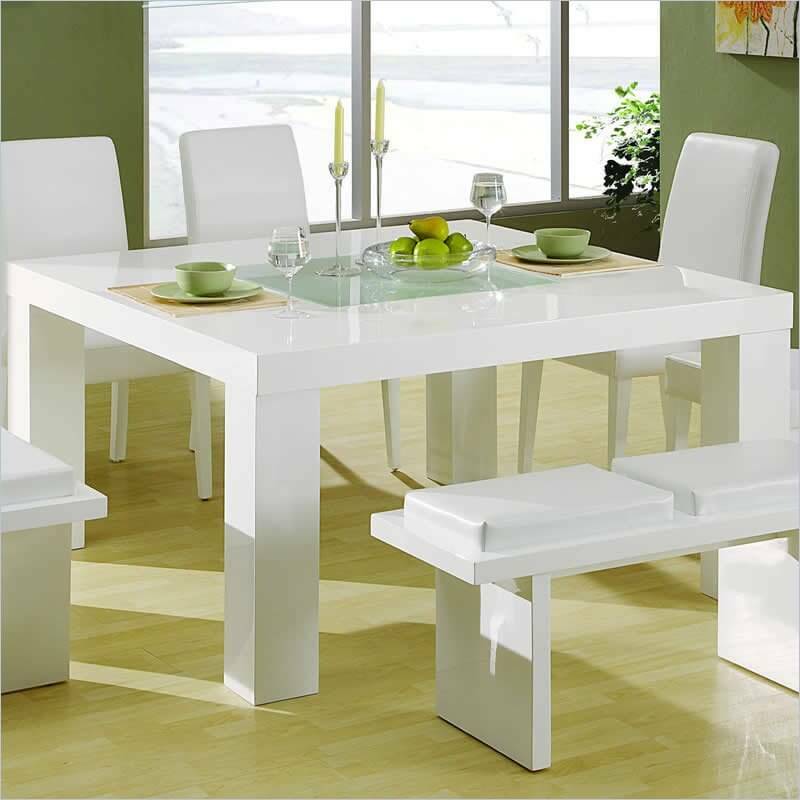 The dining table will be both seen and utilized more than a lot of home furniture, so the choice is never made lightly. 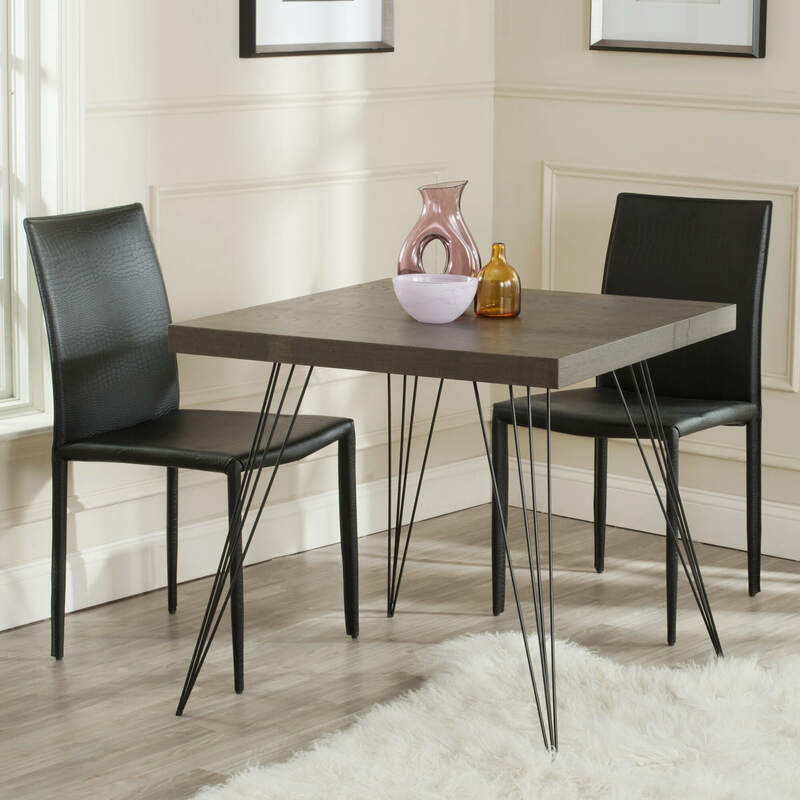 We are here to help guide you toward the perfect table for your home by breaking down the shapes, materials, and styles available today. 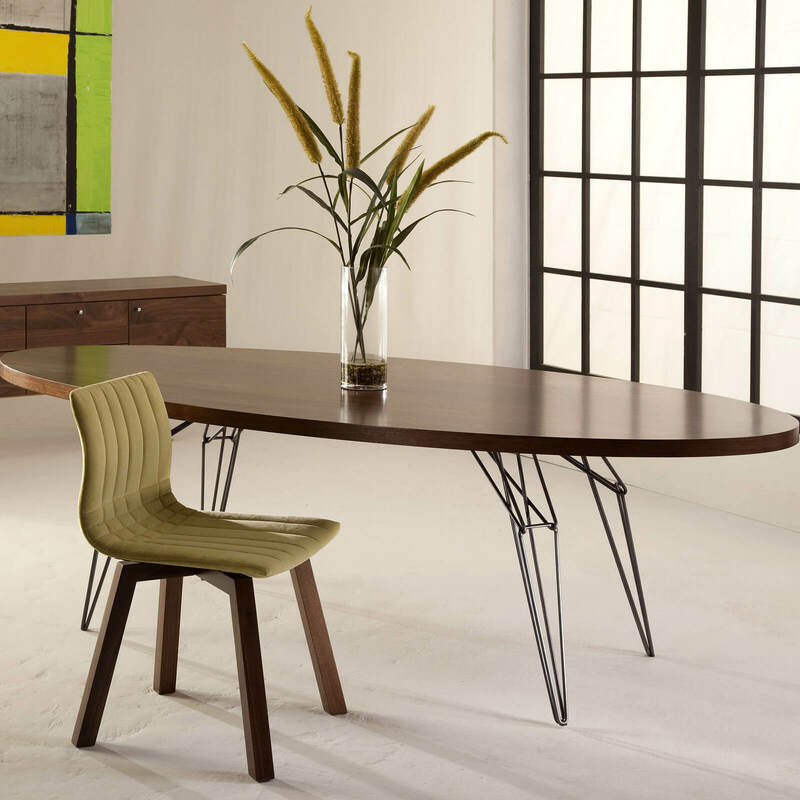 Our featured dining table, is a modern minimalist design, blending natural wood and high tech glass, with foldable leaves at each end. Read on for explanations and examples of each of the important shapes you’ll come across when looking to make your dining table purchase. After this major decision, move on to the build material you’ll want to select. Finally, we bring you a suite of styles to fit your lifestyle and home as perfectly as can be. FYI, go here for small dining tables. In general terms, the overall shape of your table should be the first consideration. Once you’ve decided on a shape, the materials and style may follow. We have provided a pair of examples for each shape, to emphasize the wild variation within each category. Also see our parts of a dining room table here. 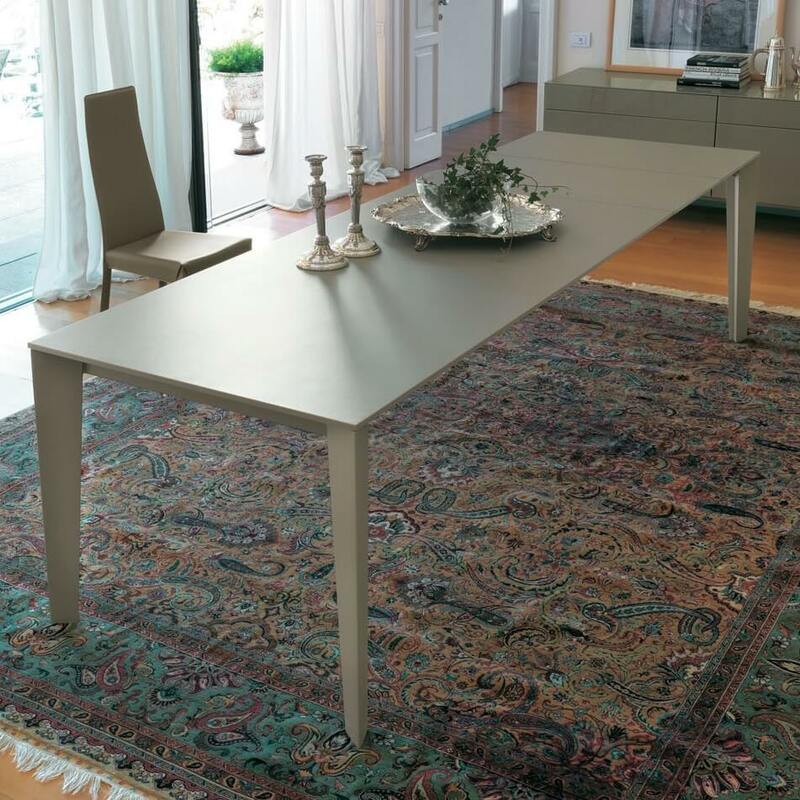 As the most popular table shape, rectangle comprises the most populated category. Being the most functional shape allows for a playfulness of style that spawns a wide variety of tables. Our second example is a glossy, minimalist rectangle table. The square is the simplest table design. Four legs, equidistant from each other. 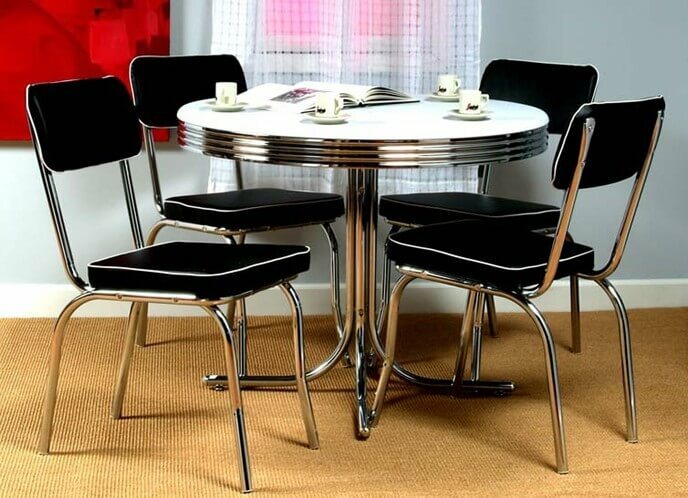 These are perfect for four diners and compact spaces. Our second square table design features a glossy white surface and ultra-minimalist design, perfect for brightening any space. 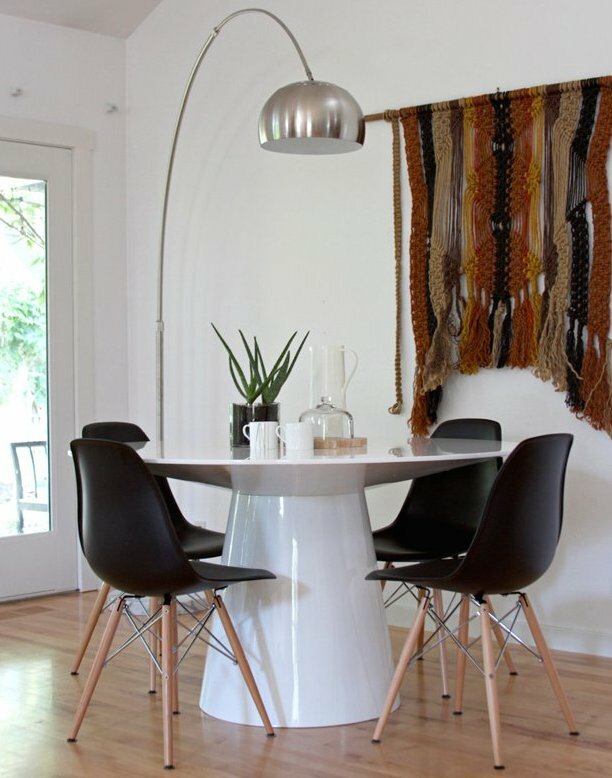 Round tables allow for shifting seating options, and often hold features such as hinged edges or a leaf, which turns it into an oval shape. 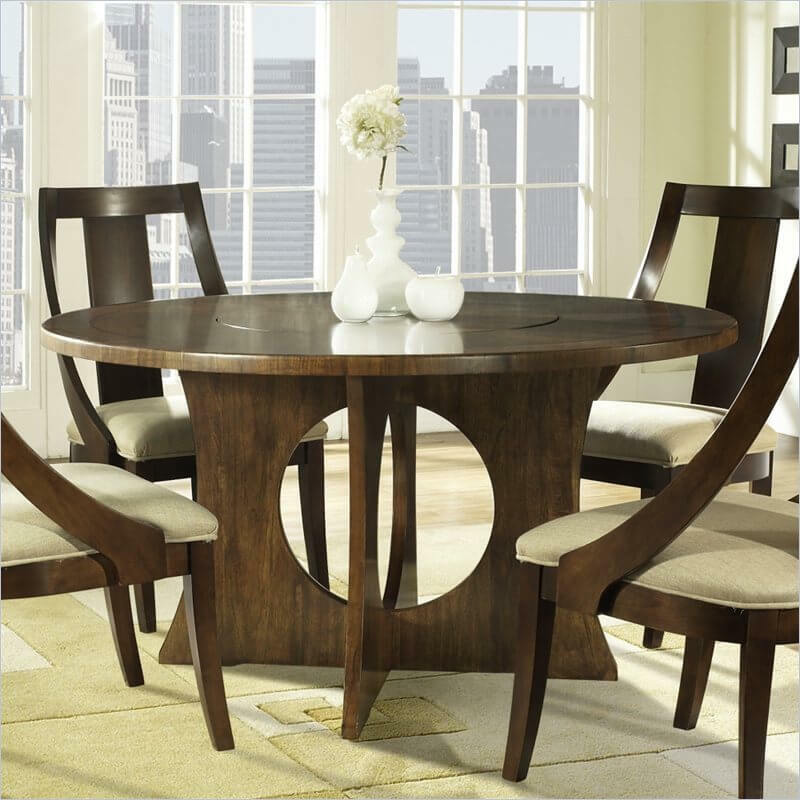 Our second round table is a striking all-wood example, with central lazy Susan built-in. The oval design is a popular choice, allowing for the sensuous curves of a round table, but with a lengthier surface area providing more space for diners. 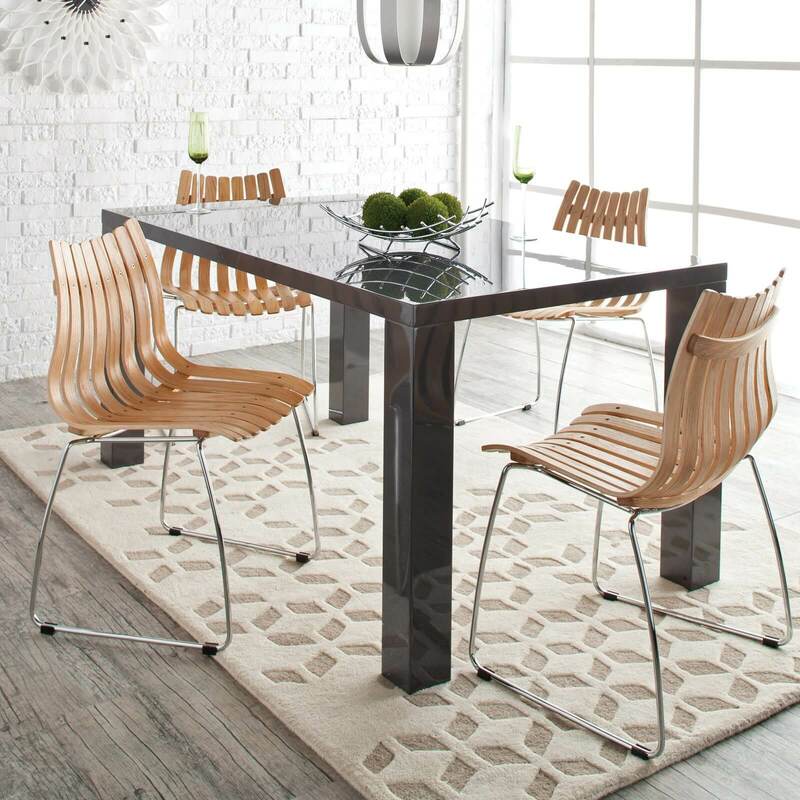 Our second oval table example is a modern minimalist design, with a narrow, long body over wire frame legs. The idea of freeform design is that there is no concrete definition. This category comprises any tables that do not fit within standard shapes. Our first example stands in a rotated L-shape, with a pair of standard legs supporting opposite a full slab. 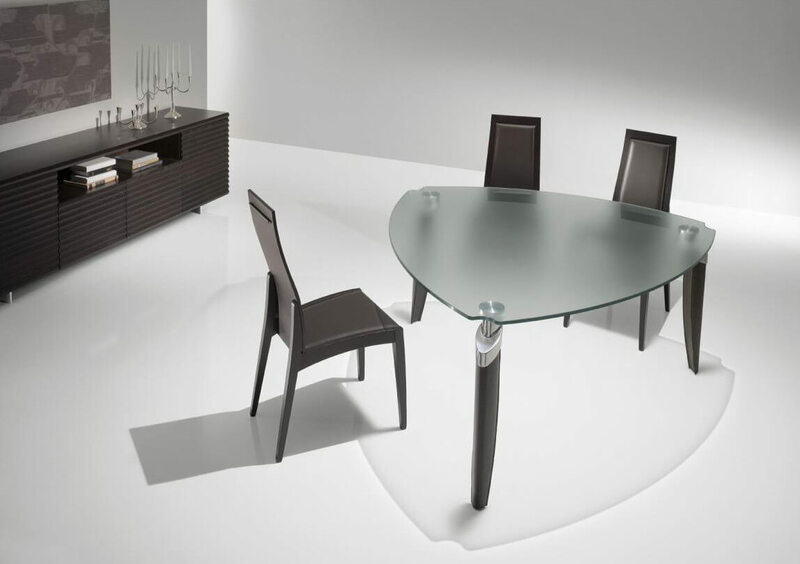 Our second freeform example stands a rounded triangle shape in contemporary glass and metal construction, with lengthy sides for two diners each. The tabletop is where you’ll interact most directly and often with your dining table. It is, of course, the most important element of any table’s construction. When you’re happy with its appearance, you can forego placing a tablecloth. While many designs are holistic, with the same material used throughout, some tables feature a different top material than the frame build, so we are focusing on this aspect for our material category. Our example wood table is a unique piece, with one side of the structure holding ample built-in shelving for decorative or utilitarian storage. Glass tabletops bring an elegant, airy feeling to any dining room, opening up the visual space and providing a clean, modern surface to interact with. Our featured model stands on a graphite X-shaped frame. The laminate tabletop is based on a multilayered construction, allowing for a sturdy, appealing, yet wear-resistant surface. 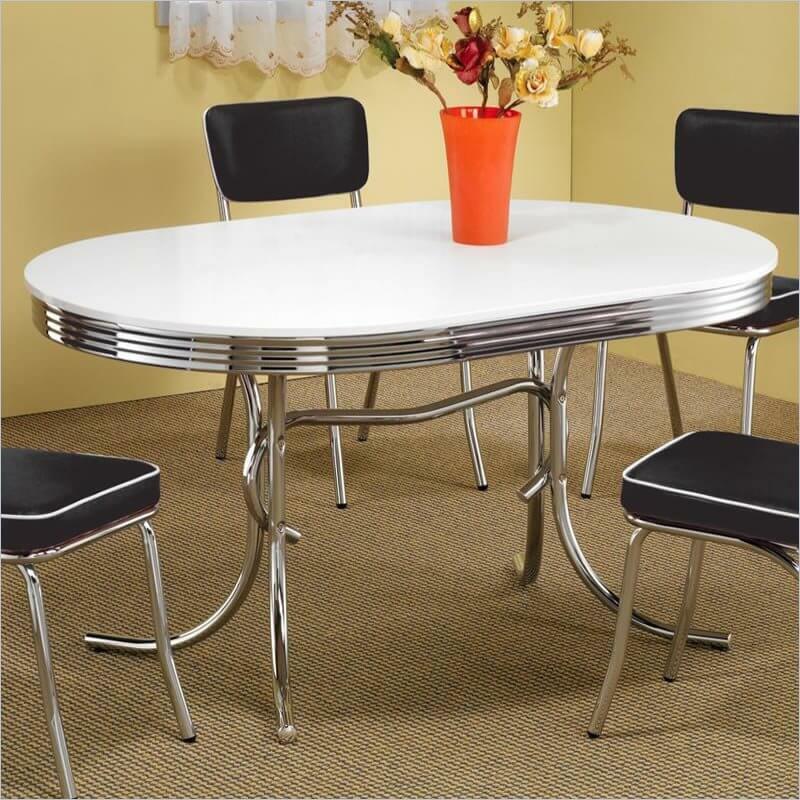 Our example here is a white PVC laminated table with chrome ring frame. 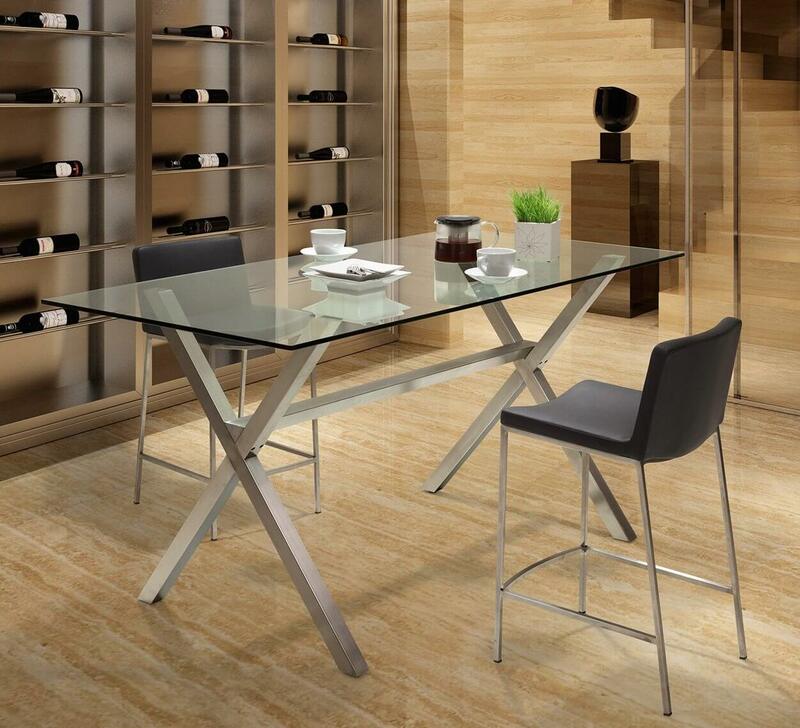 Metal tabletops bring a modern, hard edged touch to any dining room. The material is stain resistant, hardy, and cool to the touch, and fits well with industrial or contemporary styled spaces. Marble is often seen in homes as a kitchen counter top, but can be found on certain luxurious dining table models. Imbuing any space with an elegant, rich tone, marble tabletops will present a heavy, textural surface that’s cool to the touch and easy to clean. One of the more unique tabletop constructions involves the use of tile. Whether across the entire surface, or used artfully in specific placements (usually framed in wood), tile can make for a textural, detailed surface to dine on. 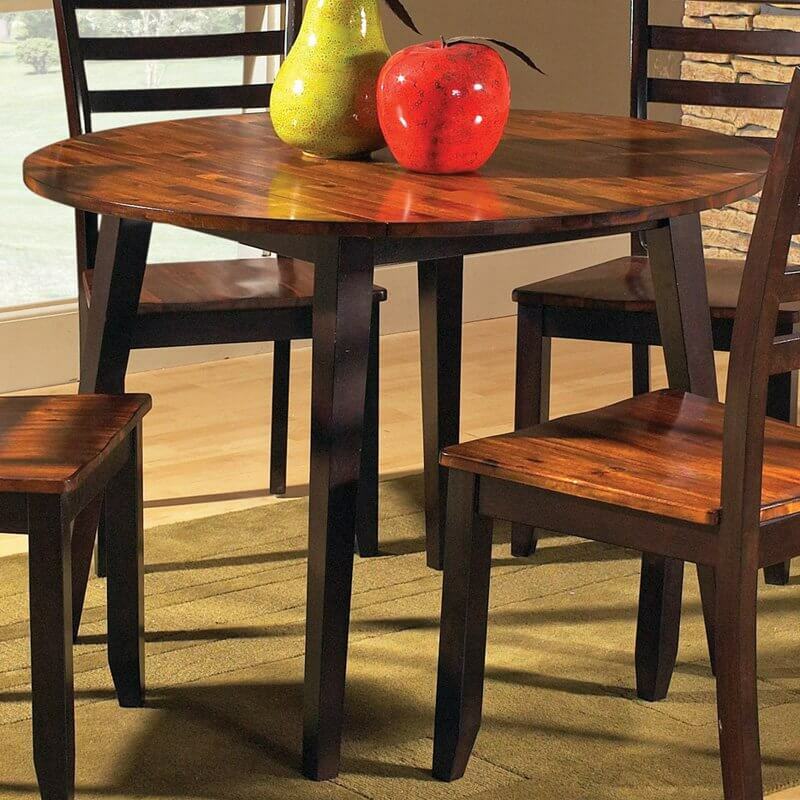 Traditional style is still the most common you’ll find when shopping for dining tables. With elegantly carved wood, detailed textures, and rich proportions, this style is timeless and powerful. Modern style evokes a graceful mixture of utility and aesthetics that flourished beginning in the 20th century, with clean lines and sharp angles framing unfussy surfaces. This table brings a thin, airy element to any room. Rustic style utilizes unpainted wood in more natural, hand-carved shapes for a simplistic, back-to-nature feel that is popular in cabins and cottages across the country. 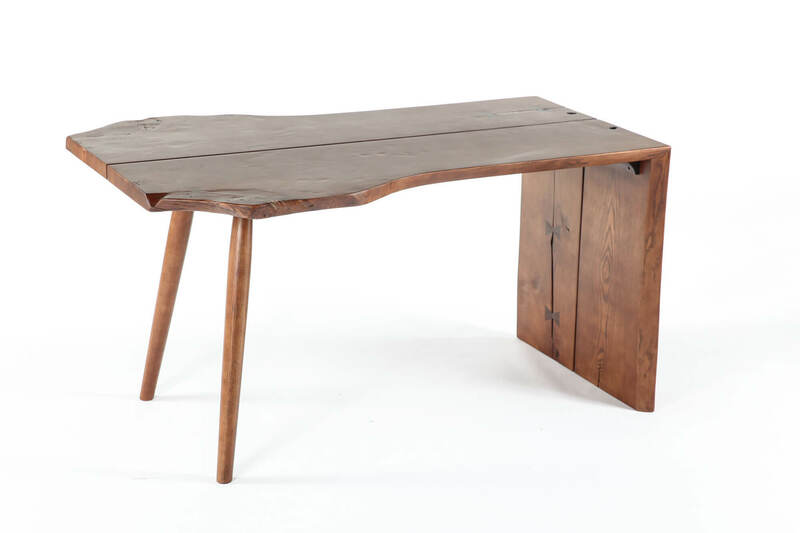 Our featured example has a rounded log-style frame beneath a soft edged flat table top. 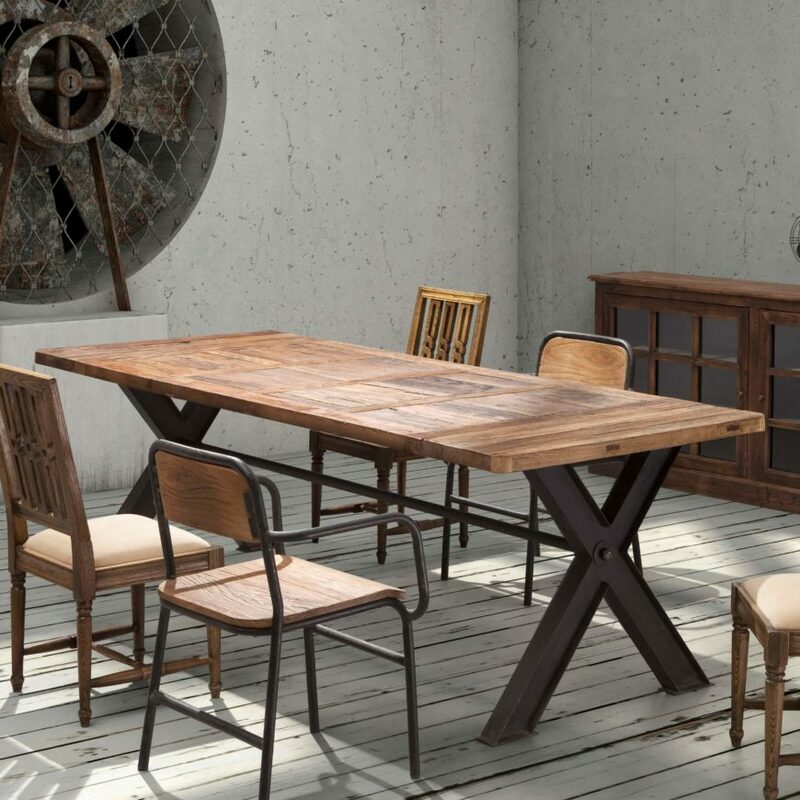 Industrial style is meant to convey the look and feel of factory machinery and tools, with naked metal and bold, strong wood shapes paired into a purposeful look. 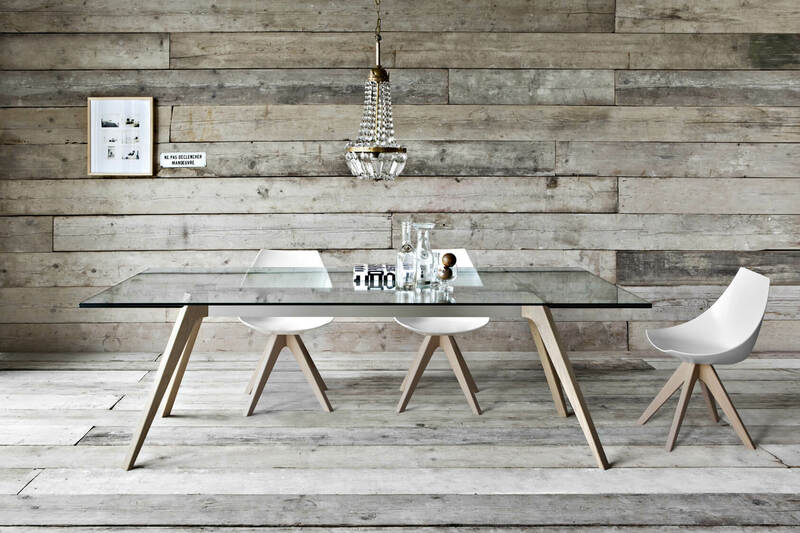 Our example table features a crossed I-beam frame and natural hardwood tabletop. Shaker furniture is defined by a direct focus on simplicity and utility, bereft of unnecessary embellishment. Our example table in natural wood tone features a solid rectangular construction, simple lines, and a matching set of dining room chairs. Contemporary design can appear in a wide variety of looks, so long as they meaningfully present an “of the now,” up to date appearance. Contemporary tables can be found in every type of material and every shape configuration. Our example features an all white circular construction from the base up to the tabletop. 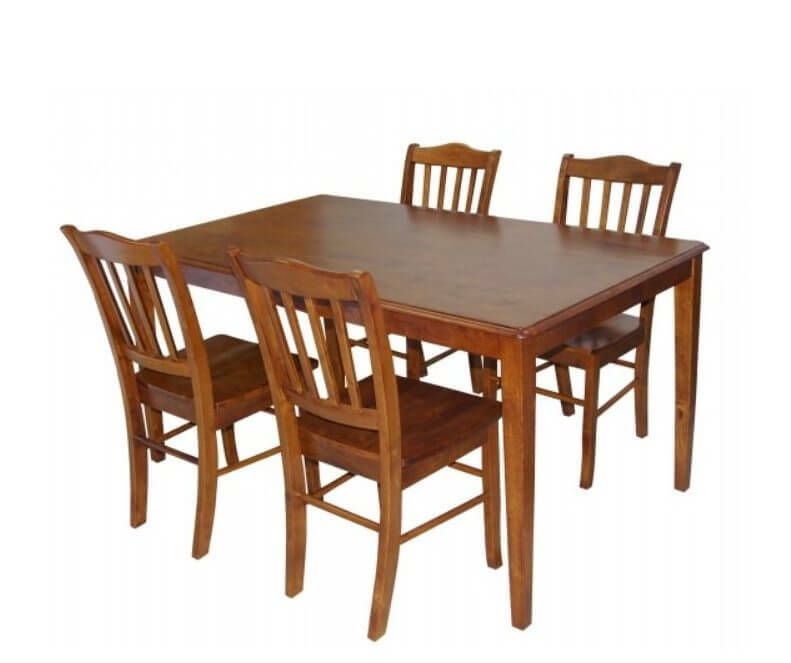 Dining room table capacity refers to how many people can comfortable be seated at the table. As you can imagine, capacity varies considerably. 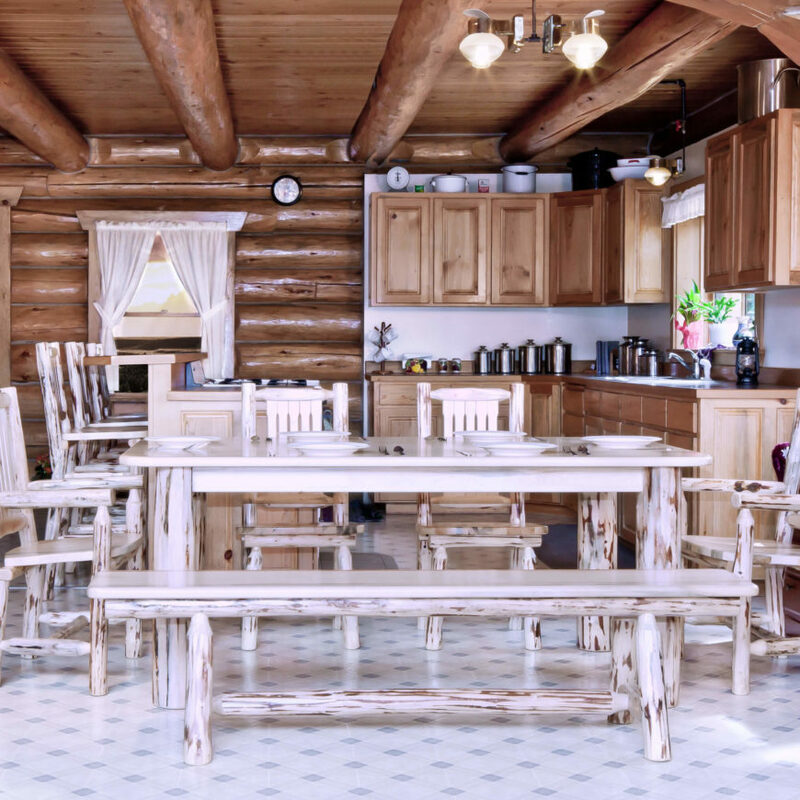 While you want to maximize seating capacity, you don’t want to end up with a crammed dining room where nobody has any space to get in and out of their seat. 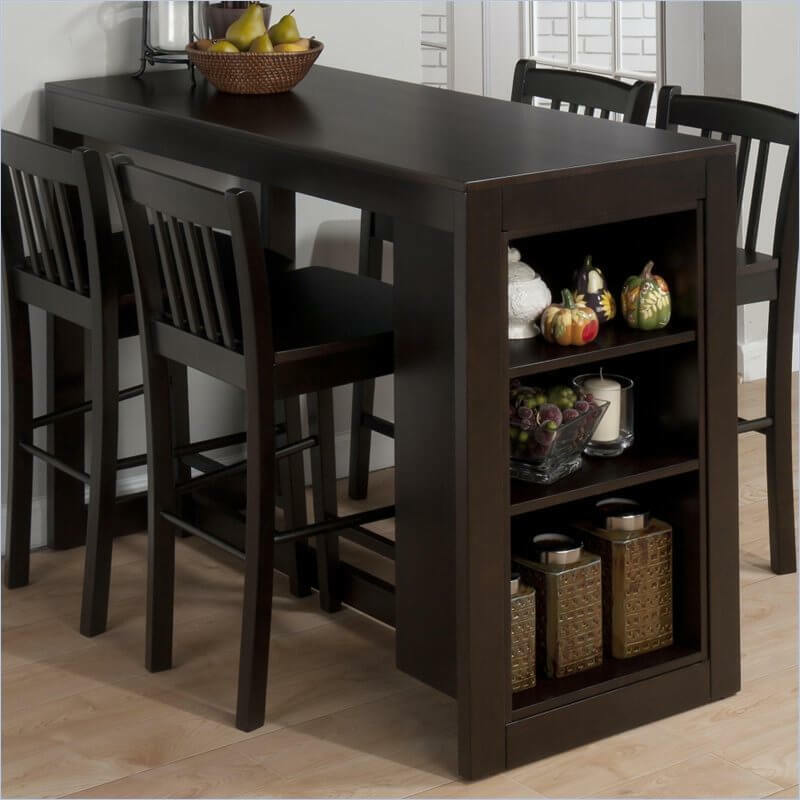 Check out our collection of small, space saving kitchen dining sets and kitchen table sets under $200. 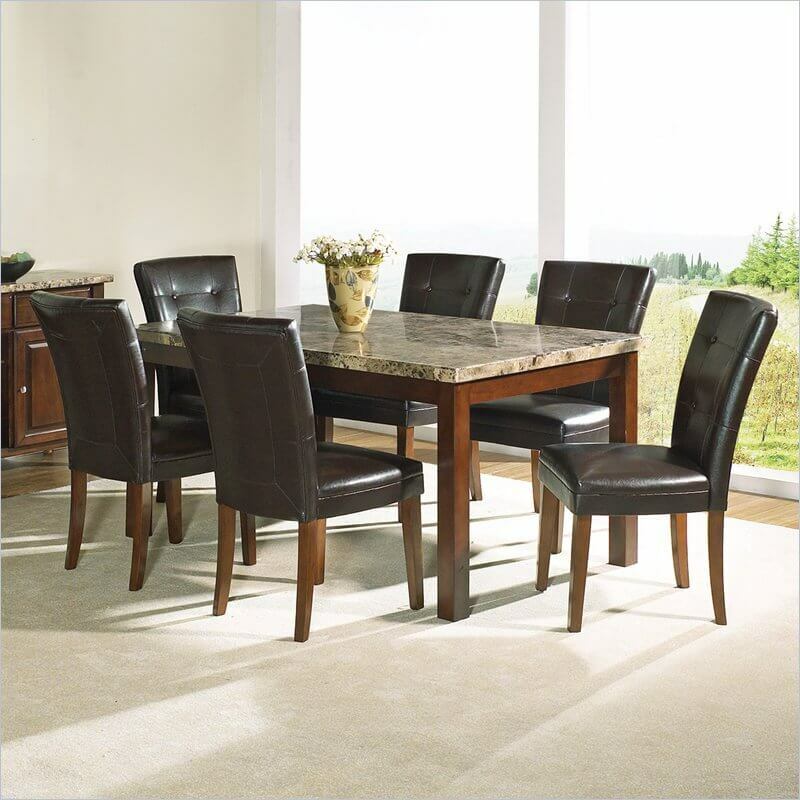 4-person dining room table in formal dining room. 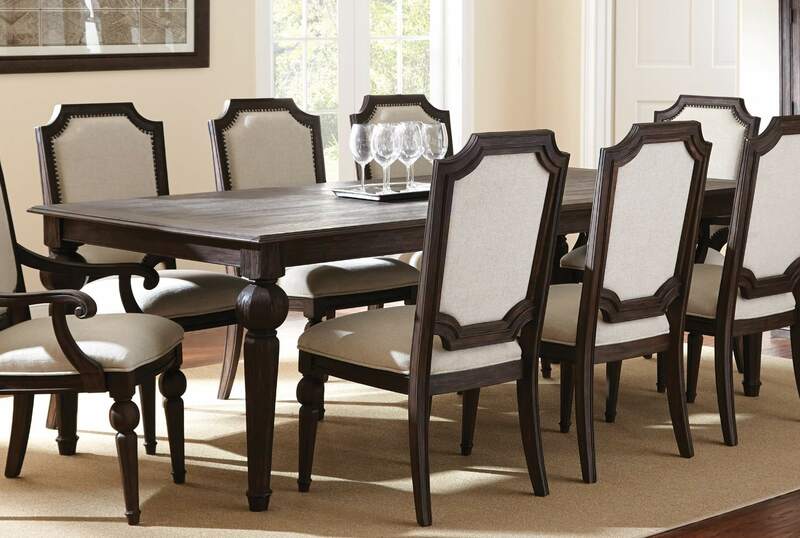 8-person dining room table in formal dining room. Large 10-person dining room table in large formal dining room in luxury home. 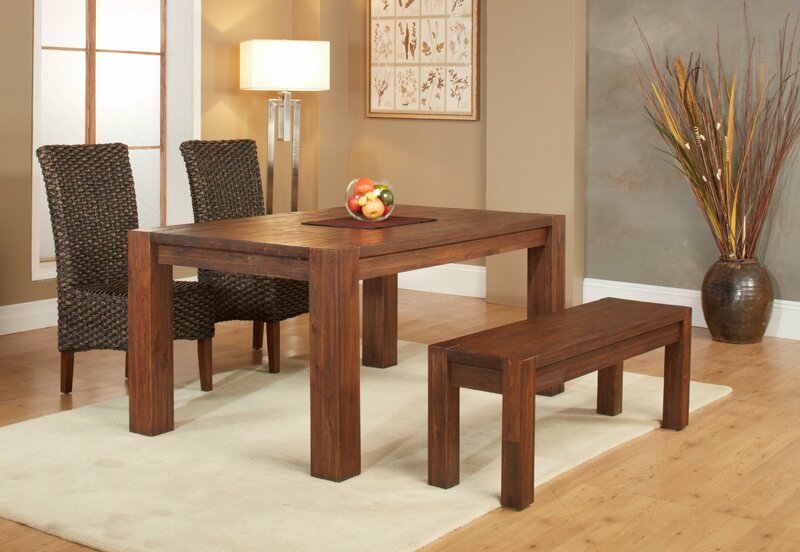 4-leg trestle hybrid dining table. Custom modern pedestal base dining room table. Slab top: No drop down or under top frame. Results in more legroom. Drop top: Frame built under top for added support. Results in less leg clearance. Below is an illustration showcasing 3 popular types of table legs. The other type is a straight leg – whether straight round or straight square. 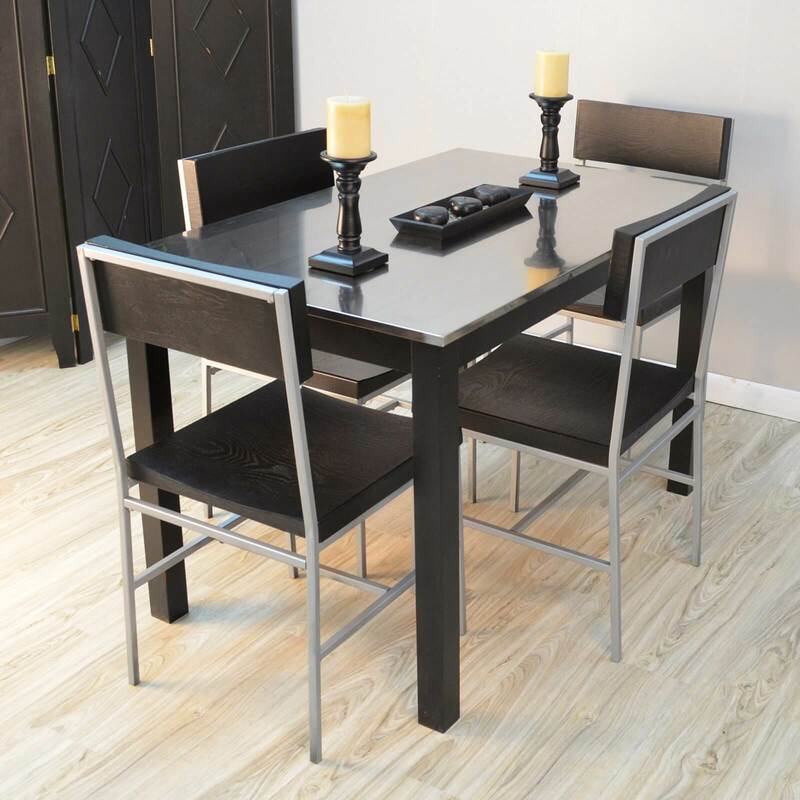 => Check out all 16 table/furniture leg options here.